A Michigan State student has come forward after alleging in an anonymous Title IX lawsuit last year that three unnamed Michigan State basketball players raped her and that the school’s counseling center discouraged her from reporting it, according to ESPN. "I'm about to graduate in May, and for most of my college career, this has been a heavy burden on me and my family. ... I am no longer afraid. I'm empowered to do this," she said Thursday. "I know that there are others who exist and they too are afraid. I want to be an example for them. The silent survivors matter and are worth fighting for." In her Title IX lawsuit, Kowalski alleges that she, then a freshman sports journalism major, met members of the Michigan State basketball team at a bar on April 11, 2015, was invited to a party back at one of their apartments, began feeling discombobulated despite not having much to drink, was taken to a bedroom and thrown onto a bed where she was raped by three players. "Instead, I was intimidated and told I was swimming with some pretty big fish," she said, reading most of her statement through tears. "I'll never forget that phrase and the immediate feeling of despair and isolation." 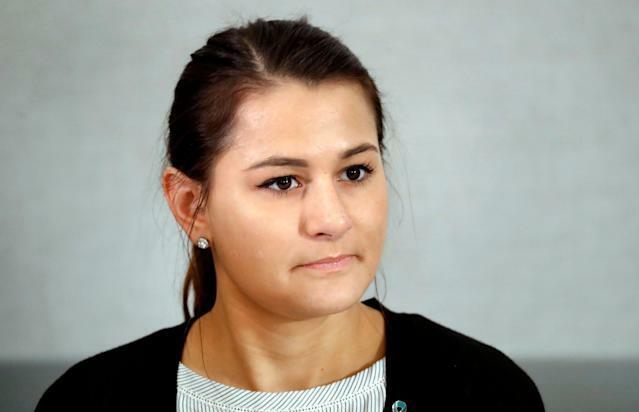 While she has filed the Title IX lawsuit, Kowalski has not filed a police report over the incident, though her attorney reportedly said that is still in an option. Michigan State has denied any responsibility for Kowalski’s assault and has requested the suit be dismissed, according to ESPN. Kowalski’s lawsuit, which is still pending, came only a few months after an explosive Outside the Lines report documented “a pattern of widespread denial, inaction and information suppression of such allegations by officials ranging from campus police to the Spartan athletic department” that went well beyond Larry Nassar, which sparked plenty of questions for basketball coach Tom Izzo. Per ESPN, Michigan State’s investigation into Kowalski’s report was one of 35 sexual violence and related misconduct complaints filed against Michigan State athletes since fall 2012.